Male fruit fly on a blade of grass. Photo courtesy of Adobe Stock Images. Set out a bowl of fruit, and they will arrive: small, buff-colored flies with garnet eyes and an attraction to fermenting bananas. Annoying but not harmful, they are easy to dismiss as unimportant. But one species of fruit flies in particular—Drosophila melanogaster—is becoming important to an increasing number of patients and their families. Fruit fly research has long provided fundamental insights that turn out to apply to humans. Fly research has helped us learn how fertilized eggs grow into mature adults, how cells in our bodies communicate with one another, and what controls the “biological clocks” within us. Several times—and as recently as 2017—findings that began with research on the fly have been honored with a Nobel Prize for Physiology or Medicine. Now fruit fly studies are getting personal: They are becoming integrated into research with direct impact on patients. In the new and promising field of genomic medicine, teams of experts use data from the DNA sequences of patients suffering from genetic diseases to figure which of our 20,000 genes is responsible for the disease. Superficially, the path from genome sequencing to treatment is clear. Step one, use the sequence data to figure out which genes have changes when compared with genes in healthy family members. Step two, use what we know about the genes to make a specific diagnosis. Step three, customize a treatment plan based on these findings. Yet cases are rarely so straightforward. The genome of a patient with a genetic disease is likely to contain differences in hundreds of genes when compared with healthy family members, and in some cases, we cannot identify which one or more is the cause. Even when a genetic cause is identified, a treatment might not be available. Moreover, when a genetic disease is rare, few patients exist who can participate in a clinical trial, so the development of new therapies can be especially challenging. With more than a century of knowledge in the bank, we know more about fruit flies than we do about most other multicellular organisms on the planet. Researchers have developed countless tools to manipulate fly genes, as well as tests that let us study everything from cell shape to organ size, from physiology to complex behavior. One of the biggest surprises of the last 25 years has been the discovery that the genes controlling fundamental cell functions—the parts, the assembly lines, the machines—are largely the same in flies, humans, and other animals. With flies, we do not have to ponder these commonalities in the abstract; we can test and experiment. Fruit fly researchers have begun to partner with physicians and others to use this knowledge to bridge the gap between what is learned from genome sequence data and what is required for clinicians to make a specific diagnosis and treatment plan. A few years ago, the U.S. National Institutes of Health expanded an existing program called the Undiagnosed Disease Network (UDN) to include a group dedicated to using fruit flies (as well as fish) to figure out which of several genes identified using a genomic medicine approach is the cause of a given rare or new disease. The group, led by Hugo Bellen, a fruit fly biologist at Baylor College of Medicine, introduces changes into the fly genome that mimic changes found in genes from human patients. Sometimes they even insert a human gene into a fly. Then they watch the flies to see if they get symptoms that resemble the symptoms of the human disease. By applying “synchronized bench and bedside investigations,” the group has succeeded in diagnosing what had been mystery cases. One of the newly identified genetic diseases was named Harel-Yoon syndrome, after clinician Tamar Harel and fruit fly biologist Wan Hee Yoon, whose work was instrumental in the case. In at least one UDN case, identification of the gene affected in a young patient led physicians to prescribe a treatment that they predicted would counteract the effects of a change discovered in a gene called CACNA1A. Following the first diagnosis, other cases in which the CACNA1A gene is similarly affected were identified, suggesting that the results will impact additional families. But knowing the cause of a genetic disease does not always help identify or design a treatment. For many genes, we do not know enough about their functions to understand what cellular process should be targeted or whether the activity of a gene should be ramped up or down to improve the patient’s life. In other cases, we might understand a gene’s function in detail but lack a safe drug that can modulate its activity in a way that helps the patient. Here again, biomedical research is turning to the fly. By engineering fly genes so that flies bear characteristics of a genetic disease, the insects can serve as simpler but similar stand-ins for human patients. These “disease model flies” can then be used to find genes that might be good therapeutic targets or to identify small molecules that improve disease-related symptoms in the flies, suggesting a path for development of new drugs. They can also be used to discover whether existing drugs can be “repurposed” to treat other diseases. For rare diseases in particular, the fact that flies are such prolific reproducers is a significant advantage. Within a relatively short time, large numbers of flies can be tested with thousands of possible drugs. Another advantage is that flies can be studied throughout their lifecycle—as they grow and develop from embryo to adult—and across their lifespan, which for a normal adult fly is about two or three months. In addition, flies process drugs in organs similar to our own liver and kidneys, giving a fuller picture of what might happen when a patient takes a drug than might be learned from testing cells in a petri dish. Some of the challenges researchers face in conducting these studies are practical ones. How do you get a fly to take its medicine? How much of a drug do you give it? How do you monitor outcomes and analyze results? 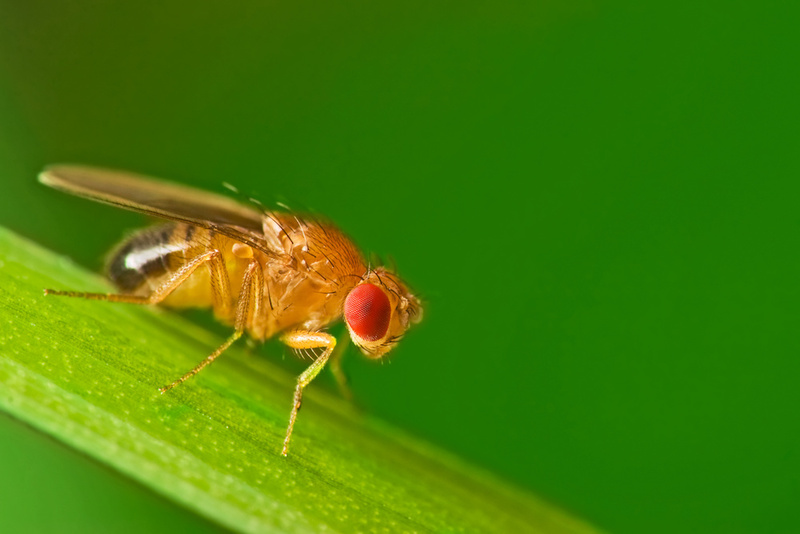 Scientists such as Daniela Zarnescu of the University of Arizona and Tin Tin Su, of the University of Colorado and SuviCa, Inc., have organized workshops at which Drosophila researchers discuss their experiences of working with fruit flies and drugs. Private industry is jumping into the game as well. The biotech company Perlara, PBC, is using fruit flies, as well as yeast, worms, and fish, to develop drug treatments for rare genetic diseases such as NGLY1 deficiency, which can affect the development of speech, cause uncontrolled movement, and result in other problems for children with the disorder. The expectation is that the advantages offered by using the fly will help in the development of new drugs to treat NGLY1 deficiency. According to the Grace Science Foundation, research related to NGLY1 deficiency is likely to have impact on other, less rare conditions, such as cancer and Parkinson’s disease. Stephanie E. Mohr is a Drosophila biologist and lecturer in the Department of Genetics at Harvard Medical School. She is also the author of First in Fly: Drosophila Research and Biological Discovery (Harvard University Press). Voluntary conflict of interest statement The author has ongoing academic research collaborations with the Bellen and Zarnescu laboratories. The author has no financial interest in either SuviCa or Perlara, and no other financial conflicts of interest related to the content of this article.